Football is an interesting sport – not just cause it’s referring to soccer in many parts of the world, where it’s known as “football” in some or another, but also because it’s one of those sports with many moving parts. I’m sure there are football enthusiasts who love to analyze every formation, every detail of each player tackling each other and all that, and just figuring out what went right and wrong in a single moment, where most fans would just be able to cheer on the play itself without paying so much attention to the complexities and strategies associated with each play. Me, I like looking at cards. Like Passimian. Passimian is a Basic Fighting Pokemon, 110 HP, with a Psychic Weakness, no Resistance, and a Retreat Cost of 1. He’s got an Ability in Power Huddle that boosts the damage done by other Passimian by 30, so long as he’s on the Bench and it’s attacking an Evolution Pokemon, and his own attack in Rock Hurl is a 2-for-40 move that’s unaffected by Resistance. Funny enough, the other Passimian we have right now was printed in Sun & Moon, and its main appeal is in Team Play, a 2-for-10 move that could do 30 more damage for each Passimian on your Bench. In short, you could have 1 Passimian (SM) Active and attacking and 1 Passimian (USM) on your Bench boosting its damage with Power Huddle – just the pair of them makes for a 2-for-70 move! Now imagine two more Passimians on the Bench, and the damage can climb anywhere up from 100 to 190! That’s pretty crazy! The main issue though comes from one little rule: you can only have up to 4 cards with the same name in your deck. In other words, you can’t have more than 4 Passimian in your deck, meaning you have to find the right ratios to maximize the damage output while also not sacrificing yourself to the whims of getting completely trampled over by your opponent. I feel like a 2-2 split would be ideal – you run 2 Passimian (SM) for the offensive front and 2 Passimian (USM) for the boosting. I imagine ultimately a 3-1 split will be used the most, in favor of getting the damage out rather than waiting to have everything in play, but it’s also important to remember that Passimian (USM) only boosts against Evolution Pokemon, so against any Basics or, in particular, Basic-EX/GX, it’s not gonna do so much. Still, coupled with a Strong Energy and a Choice Band, it’s hard to say Passimian can’t get over stuff. It’s not gonna be any level of top-tier for sure – the consistency of getting out 4 Passimian at once is questionable, not to mention the extra damage will only get you so far – but I can imagine a few players will see how effective it is overall. I wouldn’t expect it to end up being crazy, but like I said, it’s likely to make an impression. Side Review: Weavile – Despite all the good things that could come from him, Weavile just hasn’t shown up that much in a competitive environment. Looking through the latest Standard decks, it’s probably no wonder – not too many are playing with Abilities. Sure, everyone’s running at least 1 Tapu Lele-GX, and it’s probably more effective against decks like Gardevoir-GX and Volcanion-EX, but outside of that…there’s not too many Abilities that need to come down on the field. Combine a lack of necessity with the idea that once someone sees you’re playing Sneasel they can guess you’ve got a Weavile nearby, and it’s probably no wonder people aren’t opting into a 1-1 tech. Next Time: The ruler of another world returns but only once! Passimian (SM Ultra Prism 70/156) makes another appearance in the TCG. A Basic Fighting Type with 110 HP, weak to Psychic, and a retreat cost of one, it has an ability and an attack. 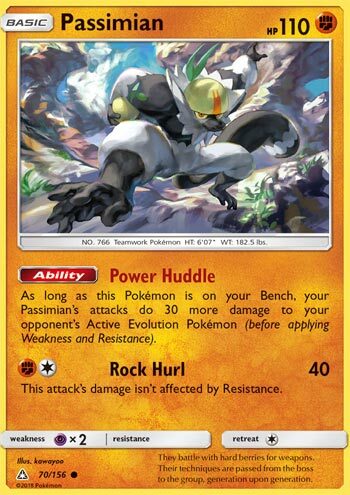 The ability, Power Hurdle, states that as long as this Pokémon is on your Bench, your Passimian’s attacks do 30 more damage to your opponent’s Active Evolution Pokémon (before applying Weakness and Resistance). Rock Hurl does 40 for FC, and ignores Resistance from your opponent’s Active Pokemon. The idea would be to have all four Passimian in play to maximize the extent of the ability. With an active Passimian and three Benched Passimian with Power Hurdle (remember, the ability works while Benched), Rock Hurl does 130 damage, enough to 2HKO without help. You can, however, boost the damage output even further beyond Power Hurdle. Choice Band, Regirock-EX, or the upcoming Diancie Prism Star, can bring it to 190 damage or even more. Or how about adding Strong Energy to the mix with lucky outcomes of Max Elixir, then we’re taking 200+ damage! That seems good and all, but there’s one more Passimian that can be paired with today’s card. Passimian (Sun & Moon 73/149) was the 7th best card of Sun & Moon from the Pojo review crew because it carries its second attack called Team Play, which costs DCE for 10 damage, plus 30 more damage for each of your Benched Passimian. With Power Hurdle, that’s effectively 60 more damage due to the effect text and the ability. With three Benched Passimian at most (unless we get some sort of Passimian GX that boosts damage output even further) Team Play will do 190 damage (enough to KO all non-GX Stage 2s), Choice Band brings it to 220 (enough to OHKO Basic GX and some Stage 1 GXs), Diancie Prism Star’s Princess Veil ability makes it 240, and Regirock-EX finishes at 250 damage, enough to OHKO anything. That’s asking for a lot: An Active Passimian with Team Play, three benched Passimian with the Power Hurdle ability, a benched Diancie Prism Star, and a Regirock-EX. Pretty much you get what you paid/invested for. I still think you can save one Bench space by not including Regirock-EX; Professor Kukui can help you deal more damage. Of course, that’s assuming you have all the moving pieces, because some cards may be prized. If either amount of Passimian cards are prizes, it will greatly reduce damage output from both Team Play and the Power Hurdle ability. If one is prized, then Team Play does 130 damage; if two are prized, then it becomes 70; and if three are prized, then it becomes 10. You might get a prized Passimian or two if you used Gladion or Kartana-GX’s Blade GX attack. Ability denial can be a problem as well, Alolan Muk’s Power of Alchemy and Garbodor’s Garbotoxin shuts down Power Hurdle, but Team Play will still OHKO Garbodor and can OHKO Alolan Muk with a little help of Professor Kukui or Muscle Band in Expanded. So looks like Team Play is a counter of a threat that would’ve cripple Passimian (both Ability denials)! Then there’s Jolteon-EX and Pyroar from XY FlashFire which can wall Basic Pokemon. Flash Ray needs to be repeatedly used because it is an attack, but Intimidating Mane is intact due to being an ability. Those two can still see play and can cause some grief if you’re unprepared. Despite those drawbacks, Passimian has good prospects in both Standard and Expanded. It gave a deck that was budget friendly a much needed boost to make a Passimian deck competitive, without having to resort to investing in expensive cards. You can still invest cards to make it better, though. Mew-EX or Mew from XY Fates Collide to copy Team Play for 130 damage while exploiting Psychic Weakness. Tapu-Lele GX and Brigette to summon three Passimian to your bench. If you don’t have either of those cards, it’s no big deal for a Passimian deck. However, Passimian suffers in Expanded due to Pyroar walling Basic Pokemon and Mewtwo-EX attaching a DCE to use X-Ball to perform a revenge OHKO for 160 damage. Those cards may not be seen as much, but it is still worth mentioning in case random players decides to bring in too many counters because they have no clue what is going on. In Limited, Passimian is almost broken material. The rarity of this card is common, so you’ll have lots of opportunities to pull this card in four packs. You could pull a regular common and a reverse foil of Passimian. And there’s no limit on how many cards you can have on Limited. So assuming you pulled six Passimian (because that’s the maximum amount of Pokémon you can have in play, one Active Pokemon and five Benched Pokemon), Rock Hurl can do 190 damage, enough to OHKO any Basic Pokemon in the Ultra Prism set. Getting all six in play, however, is a task for a Passimian player to complete as well as needing two energy attachments. Conclusion: Even without Passimian (Sun & Moon 73/147), today’s card is still a good card, still reaching 2HKO potential. What hurts the most is deck construction: a deck that does such a thing will be forced to use exactly one Passimian from Sun & Moon and three Passimian from SM Ultra Prism to generate the maximum payoff, with no other variations. That’s why I didn’t consider this card to be on the Top 10 of SM Ultra Prism, but I could’ve had it as a runner-up past 10th place. All that’s left is for me is to give a better than average score. As for Passimian from Sun & Moon, I would’ve given it a 3.5/5 on both constructed formats when it came out, but with today’s card, I would have given it a four out of five. Passimian (UP 70) received its third different version in the Ultra Prism expansion set. It has been a 110 HP Basic Fighting Pokemon in all three different incarnations. This Passimian is the first one with an ability, however, and it would appear to benefit the archetype at first glance. Power Huddle – if on your bench – gives your attacking Passimian a bonus thirty points of damage. Power Huddle only gives you a bump against evolution Pokemon. Power Huddle doesn’t apply to Mew. Fortunately, they didn’t write the text as, “As long as this Pokémon is on your Bench, any Team Play attack does 30 more damage to your opponent’s Active Evolution Pokémon (before applying Weakness and Resistance).” Had the designers used that verbage, we might actually be seeing more Passimian Mew than Garchomp right now (hmmm wait maybe I’m changing my position on this…). The Passimian Mew archetype is built around parking your Passimian on the bench and streaming Mew after Mew as attackers. In fairness, it’s not a bad archetype – it will win you some matches – I just kind of feel the same way about it as I do Garchomp: it’s very limited and isn’t going to be a top tier deck. I remember a year ago just annihilating it whenever I ran a deck with Garbodor BKP (remember this is pre Leaf Blower), and then after GRI Garb came out Passimian Mew became completely unplayable because it uses so many items and is Psychic weak. But it’s not completely horrible and if you’ve never tried it, you may want to play it a few times just for the experience. And you might even try one of the UP Passimians in it… it does happen occasionally that you do actually have to attack with a Passimian instead of Mew. Unfortunately for Power Huddle, it only works if you’re attacking with a Passimian, which means you’re losing thirty damage so it’s actually a zero sum effect. It would have been better if it gave a fifty or sixty damage boost – then it might actually be preferable to tech in one or two into a decklist. IMO though if I’m streaming Mews to replicate the attack of a Big Basic, I’m not replicating Passimian. I’m copying either DM Necrozma, Necrozma GX, or the new Ultra Necrozma GX that is coming out in Forbidden Light and can do upwards of 9 million damage from a single attack.